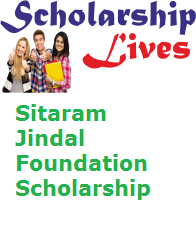 Sitaram Jindal Foundation Scholarship is going to issue Sitaram Jindal Scholarship Online Application Form for all the students who want to complete their higher education but financial problem. If you are also one of them then don’t miss this golden opportunity and fill Jindal Scholarship Application 2019 accurately according to the eligibility criteria , term and condition, how to apply online etc. The main objective of the Sitaram Jindal Foundation is to support the brilliant contenders who’re belonging to finically weaker families. Applicants who make career brighter they can grab this opportunity and apply online for Sitaram Jindal Foundation Scholarship 2019 before the last date through the link which is mention at the bottom of the page. Category ‘A’ 11th & 12th Classes of Govt. Category No. ‘A’ & ‘B’: Students must have secured 65% (For Boys) 60% (For Girls ) Marks in last year examination. Instruction to apply Jindal Scholarship Online or Offline? First, check the eligibility criteria then need to visit the official website of the portal which is www.sitaramjindalfoundation.org. Then select the Scholarship” link which is the right side of the page and Read entire details for Jindal Scholarship Online Apply. Then, press on “Apply Online” link and fill Sitaram Jindal Foundation Application Form according to the eligibility criteria which is mention above. Then upload all the documents along with Application Form 2019 and hit “Submit” button to feed entire details. Fill Sitaram Jindal Foundation Application Form accurately with required information and attach Xerox of all documents send it through proper channel before the Last Date.